Vedanta says that “Karma yoga is the yoga of action or work; specifically, karma yoga is the path of dedicated work: renouncing the results of our actions as a spiritual offering rather than hoarding the results for ourselves.” What better place than the ashrama to offer your service to the Divine diety. You can participate at Ashrama in different activities. Please explore each activity to see what time and activity suits you the best. Each activity is one of the forms of Karma Yoga. One of the important ways you can support your Ashrama is to spend your time. As you know, our shrine has hours of operation on Saturdays and Sundays from 4 pm – 6 pm. 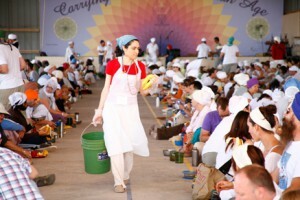 Devotees may volunteer to open the Ashrama and remain present during these hours of operation. We manage this process using a Doodle Calendar that we send out monthly via email. You can RSVP here for every month. Namaste! Devotees may choose to spend their time engaged in Karma Yoga. The Ashrama runs regularly scheduled events for seasonal work, such as gardening, cleaning, cooking, snow removal, just to name a few. In addition, we are engaged in the Pittsburgh community’s excellent work to support those most in need. We regularly spend our time at the Ronald McDonald House and Food Bank. Please see the Events Calendar for our next Karma Yoga event.